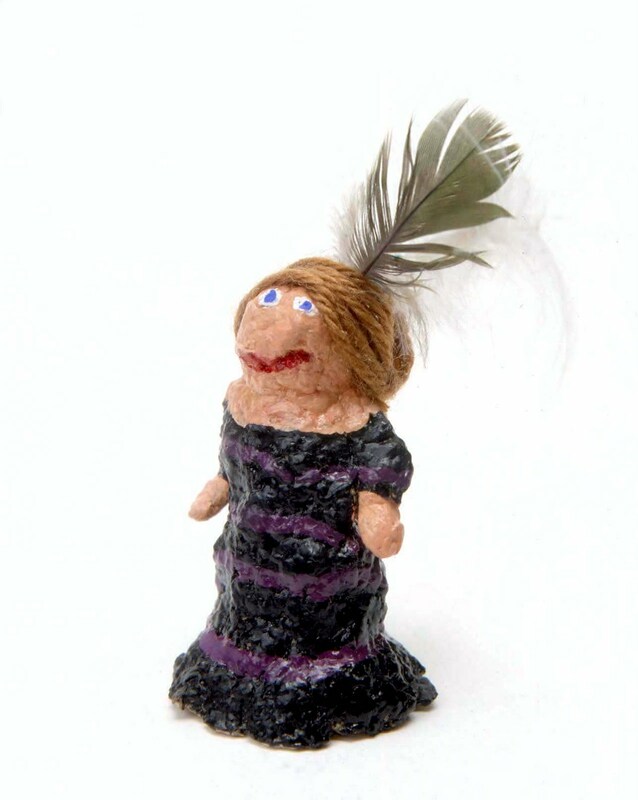 The children make small figures with papier mâché pulp and then use paint to turn them into delightful characters. For ages 6 to 9. Plan 2 to 3 sessions. Note: To prepare papier mâché pulp, rip newspapers into roughly 1-inch pieces, cover with water, bring to a boil, and simmer for an hour. Turn off the heat and let sit overnight. Put wet newspaper and water into a blender in small batches to make a mash. Squeeze out excess water. Mix wheat paste to a very thick consistency. With your hands, blend enough of the wheat paste into the newspaper to produce pulp the consistency of stiff mashed potatoes. Press the pulp between your fingers to work out any lumps. Two full sheets of newspaper, approximately 23 x 27 inches, will make enough pulp for three small figures. The pulp can be stored in a refrigerator for several days. Prepare papier mâché pulp and set out one lemon-sized ball for each child. Write the children’s names with permanent marker on small pieces of newspaper to attach to the bottoms of the completed figures. Cover an area with waxed paper for drying the figures. Explain to the children that they will be making figures of people with papier mâché pulp which is a combination of newspapers and paste that has been mixed in a blender. The clay-like pulp becomes very hard when it is dried. Tell the children that they will be making the figures three-dimensional or viewable from all sides. Demonstrate how to build with papier mâché pulp. Explain that the base of the figure needs to be sturdy for balance, so the children should plan to make long skirts or bulky pants. Additions such as arms, hats, or buttons will stick to the pulp, but they must be carefully melded onto the figure. Hair can be made with the pulp, or yarn can be glued onto the figure after is it painted. Props, such as a purse or a ball, can be made separately and glued to the figures after they have been dried and painted. Be sure to form the hands in a way that can hold onto the props. Explain that the figures must be completed in one session because they cannot be changed after they dry. Give each child a ball of pulp and have them make their figures. Attach the names to the bottoms of the wet figures. Note: Place the figures on waxed paper to keep them from sticking to the surface and dry them in a sunny or warm and dry location. Set out the dried figures. Explain to the children that in this session they will be painting the pulp people. Demonstrate how to paint the rough edges of the dried pulp by filling the brush with paint and dabbing into the cracks and crevices. Brush away any puddles of paint that will tend to chip off when dried. Explain to the children that they should paint the base color on the faces first and then paint the rest of their figures. This will allow time for the faces to dry before painting on the facial features. Children who are using yarn for the hair should paint the whole head with the skin color. 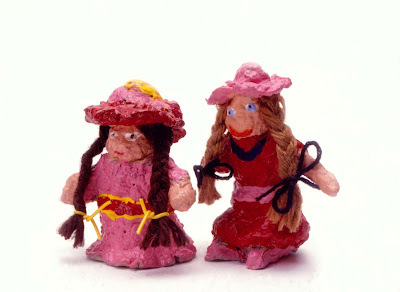 As the children paint their figures, remind them to completely cover the papier mâché pulp. Note: Have an adult apply a coating of polyurethane on the dried figures. Set out the figures, white glue, brushes for glue, and scissors. Set out a variety of adornments. Set out black permanent markers, colored watercolor markers, and paper for optional drawings. Explain that in this session the children who have completed their figures and need no further additions will be drawing pictures of them. 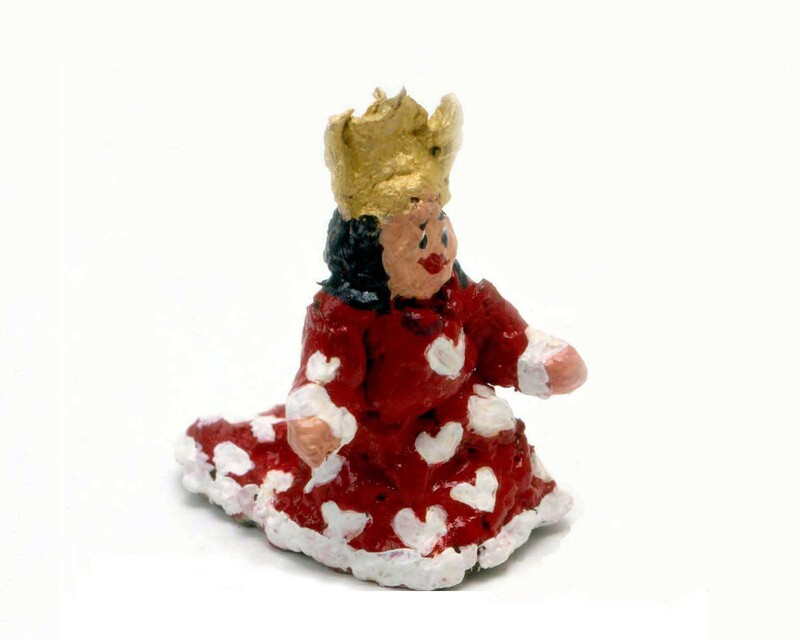 The children who are adding adornments will need to glue them to their figures before they begin drawing. Show the children how to apply a small amount of glue to add their attachments. As the figures are completed, have the children draw them with black markers and add color with watercolor markers, duplicating the figures as closely as possible. 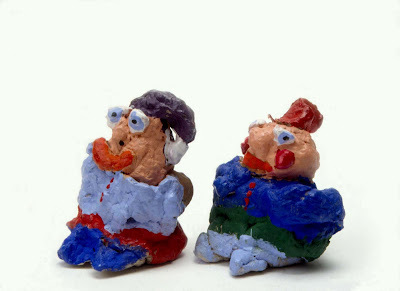 Working with papier mâché pulp takes some extra preparation, however the clay-like pulp is inexpensive and requires no kiln or special equipment. Newspapers tear easily when ripped vertically and ones that are printed with vegetable inks make more flexible pulp. Thickened white liquid glue can be substituted for the wheat paste. This project can be completed in two sessions if all additions, including the hair, are made with the pulp. Pulp figures will need good ventilation to dry, preferably near a heat source such as a warm oven or a sunny window. If a piece of pulp falls off while drying, it can be attached with white glue. Don’t be discouraged by the appearance of the dried pulp figures. With a bit of paint, they become delightful characters. Do the figures stand freely? Are the figures viewable from all sides? Is the papier-mâché pulp covered with paint so that no newspaper shows? Yuk! This stuff looks gross and feels awful! My man keeps falling over. My ballerina’s arm keeps falling off. How can I get my baseball player to hold the bat that I made? All these bumps are hard to paint over. 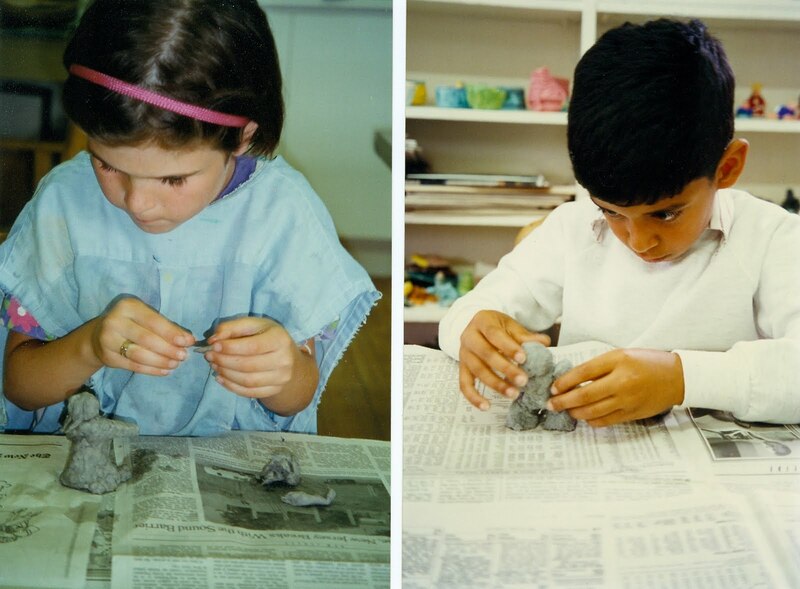 Papier mâché pulp is only newspaper and glue. It is fun to work with and will easily wash from your hands when the project is completed. When working with papier mâché pulp, you need to have a very sturdy base, so try giving your man bulky pants to help support him. When you make additions to your figures, it's important to smooth the edges carefully. Since the wet pulp is not strong enough to hold the bat, we will use glue to attach it after they are both dry. Be sure to shape the hands in a way that the bat will fit. Remember to fill you brush with paint and dab into the cracks and crevices. Don’t forget to smooth any puddles that may form.